Are you ready to carry the cross for Jesus Christ? Jesus is the way and the light. He brings a message of hope; hope for ever-lasting life. 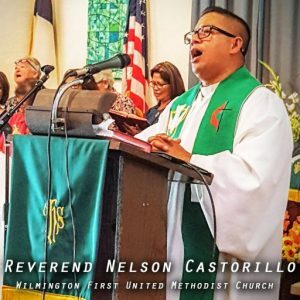 Listen to Reverend Nelson Castorillo of First United Methodist Church of Wilmington with his sermon from Sunday, August 28, 2016. If you like what you hear and are moved by the Holy Spirit, please visit our website WilmingtonFUMC.org to find out more about true salvation. Listen to Pastor Nelson Castorillo deliver his message “A Living Faith” inspired by Romans 1:14-17. A living faith is a proclaiming faith. Servants of Christ preach the Gospel to proclaim the message of salvation. God bless you for listening with an open heart. Pastor Nelson Castorillo preaches on Born Again. What is it? Is it a new fad or a new fashion. Is it a new religion? What do I get out of it? Another question that will be answered is, why do we need to be born again if we grew up in the church? Why can’t we just attend church and participate in the life and mission of our denomination? These are some of the questions that pastor Nelson answers based on what the Bible says. If the spirit moves you, please CLICK HERE to give.